Kaarl Mordeci’s heart had always burned of a hunger for power and hateful greed. It was the fuel that drove him to rise through the ranks. Yes, it was a powerful fuel indeed for a ruthless man like him. Like most brothers of Lords of Ascension, if not to say all brothers, he dreamt of commanding the warband as their Tyrant Elect. Unlike most, he could not contain his ambition. He was not the first to act on this aspiration nor would he be the last. One might eventually rise to overthrow Chaos Lord Davos Vane, but to Kaarl Mordeci his ambition would be his damnation. His men was slaughtered to the last but for Mordeci, the Tyrant Elect had reserved a faith far worse than death. Lord Vane dragged Mordeci’s broken body through the long corridors of the Undone, the ancient Space Hulk of the Lords of Ascension, from the Tyrant’s quarters on the upper deck to the nightmarish forge deep within its mutated hold. – Remember this, he said. Remember your folly, brother. Remember it as your mind breaks and insanity shatters your soul. Remember how I bested you. Remember it all through your eternal torment. The Warpsmith closed the accursed sarcophagus and breathed life into the war engine. The pain was immediate and undeniable. Mordeci tried but failed to lash out as the Helbrute was chained in place. Vane laughed as Mordeci’s frantic screams filled the forge. He laughed as Mordeci slipped into madness. He laughed and laughed. Who could now recall how many years had passed since Mordeci’s imprisonment began; how many battles had been fought; how many time Mordeci had been destroyed and resurrected again; or how deep the madness went. But from beyond the insanity and eternal sound of laughter ringing in his ears another voice in his head has started whispering promises of vengeance. 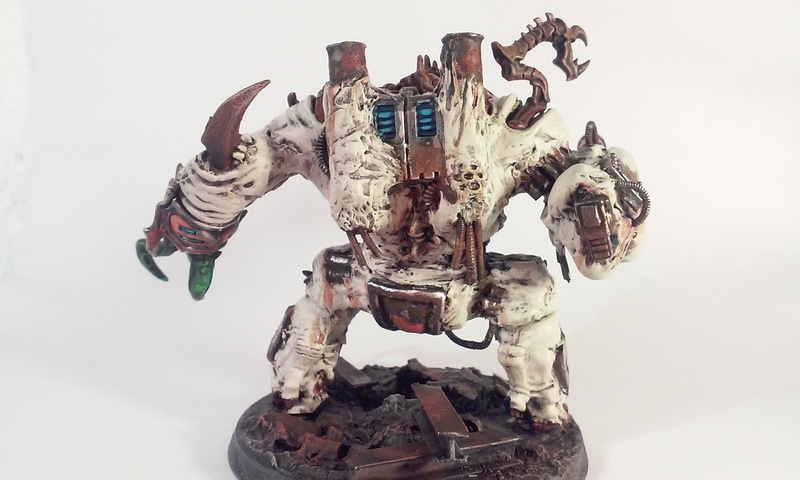 And Mordeci has been seen leading rampaging Helbrute Murderpacks, scouring the battlefields as if hunting an ancient enemy lost in the fogs of insanity. Yes! Yes! Yes! 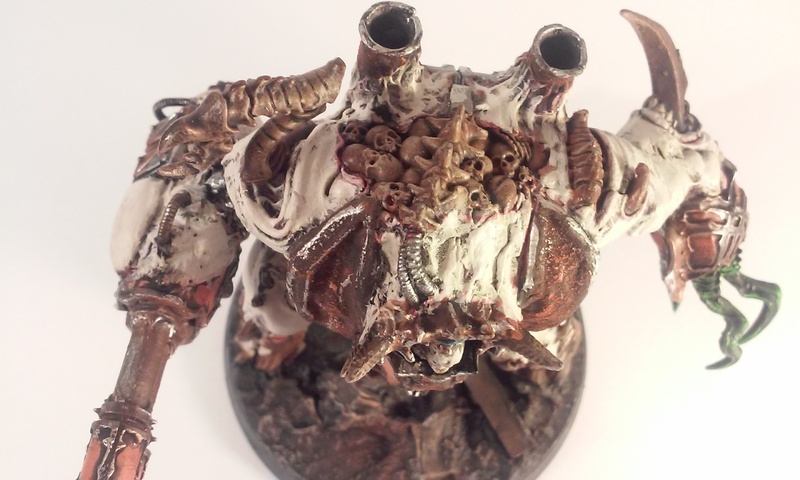 I have finished my Age of Sigmar Khorne Khorgorath Helbrute conversion. I got the motivational help I needed from DreadTober and just forced the project through. Please visit the webpage and loose yourself in the awesomeness. Now I’ve put the paint brush down and taken a step back. I’m happy with it. I really am. Check it out (why not check out its humble beginnings?) and let me know what you think. 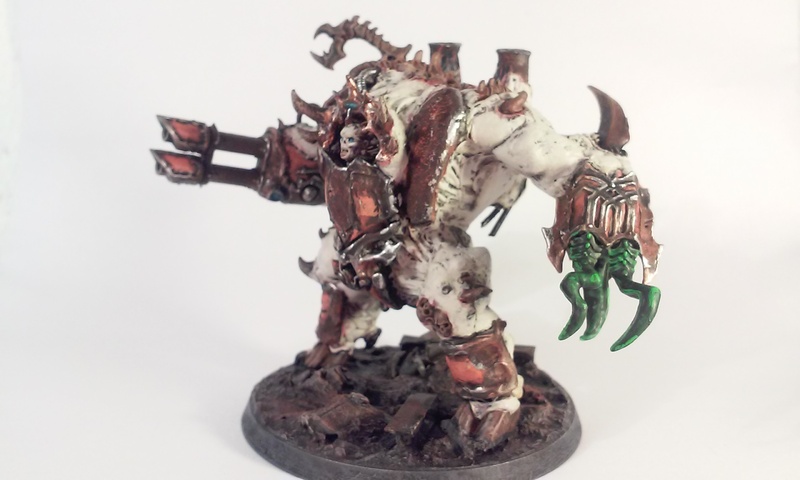 I’d love to hear your view on the Helbrute. The original models Power Fist looks really smashing. See what I did there? 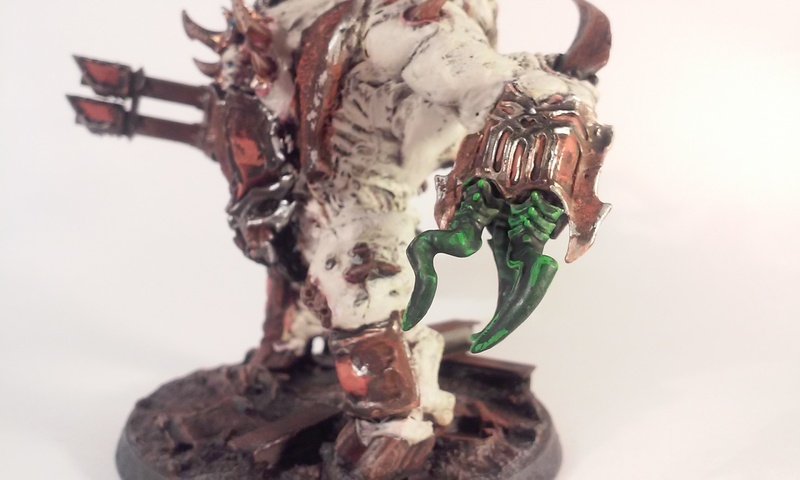 With all that white skin I had to go for a darker colour for the bone/claw or it just got lost. I like the contrast. I really like the blue spot colour on the engine block. I used a little blue spot colour on the Lascannon as well, just to break with the bleak colours. 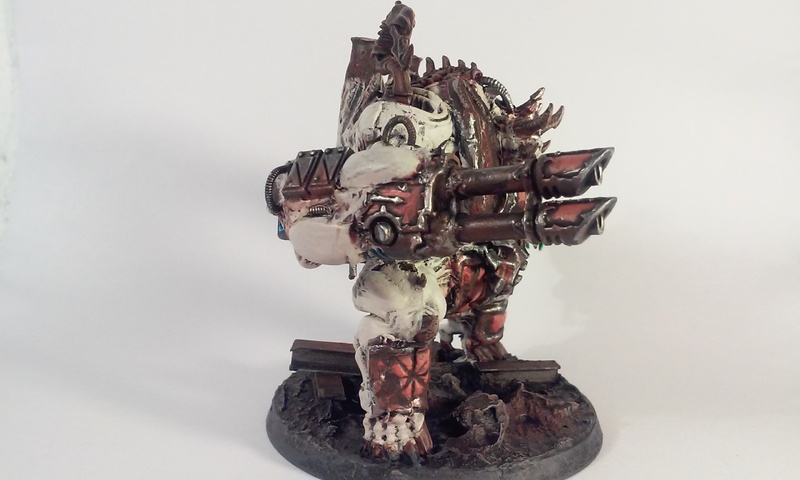 Twin-linked Lascannon. Lets hunt flyrants! I want the tentacles to pop and really look warped and mutated. The brown skulls and bones help create a dread aura. It looks wrong, but in a good way. Wow amazing model and prologue man! I can’t stop looking at him. I’ve even saved the pic to my phone hehe. Hope that’s ok. Thanks! Save it, share it, it’s all good. And quite the compliment as well. I’m glad you like. Wow… he’s stunning mate, what a beast! Lovely conversion, good shout on the brown for the skullage, and that blue spot colour really sets it off nicely. Love it! Cheers! I had some doubts that I could pull off a paint job to match my effort regarding the sculpting and converting. But I genuinely feel that I nailed it. 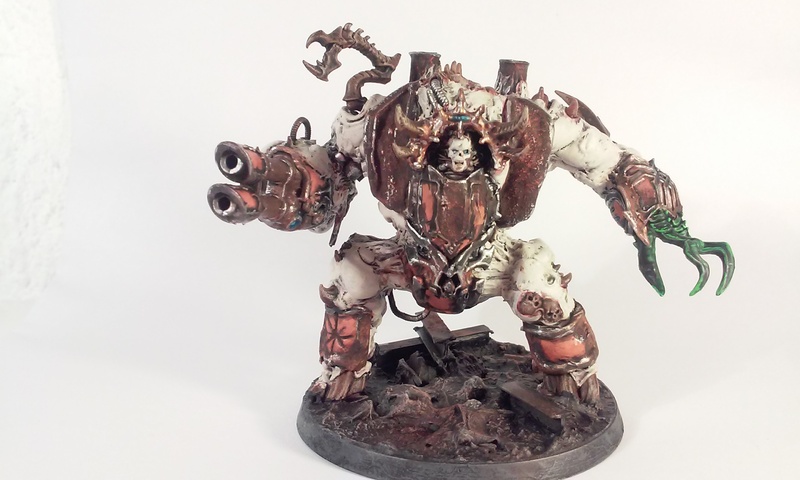 Lets hope a new codex drop soon so he’ll be a beast on the table top too. That is cracking! The combination of pale fresh and dark armour looks really striking, and nicely natural. The brown skulls work really well. 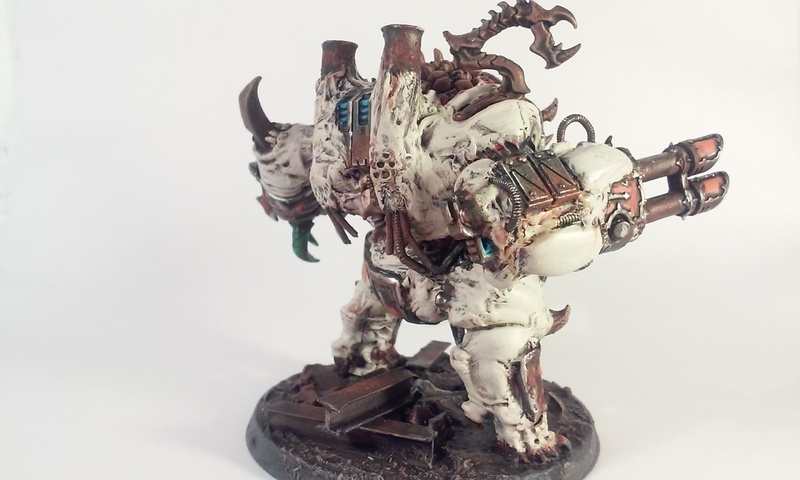 I admit when I first picked up this model my plan was to keep it fairly close to the original and use it as a mutated Khornate arena beast (counts as Helbrute with two power fists). Obviously that just seems lazy now – you’ve raised the bar! Thanks! Happy you dig it. 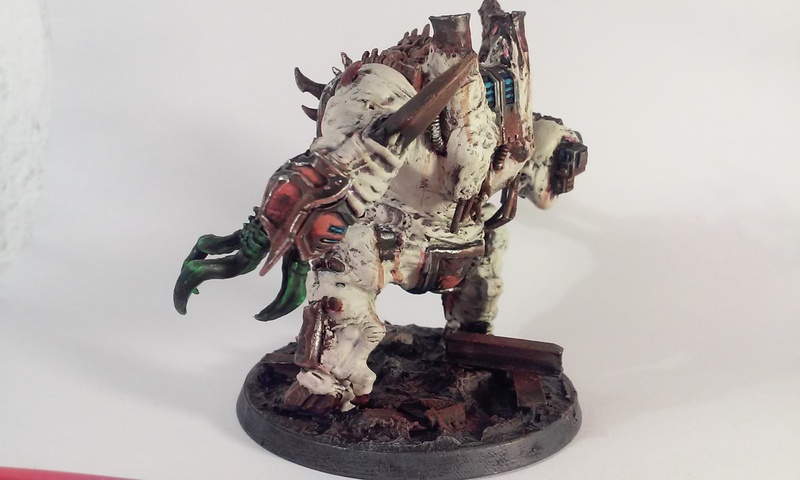 The Khorgorath is kind of thin for a Helbrute. 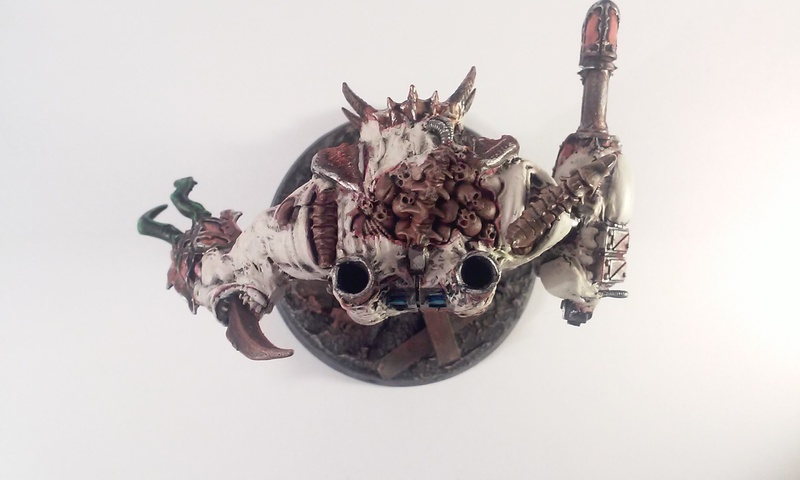 It more like a oversized Spawn or a Daemon Prince. I really needed to work on the bulk. My suggestion is go bonkers with it. You could probably do some awesome nurgle stuff with it. This model is beautifully done for so many reasons. The paintjob, the pose, the conversion. It’s just great. Thanks for taking so many photos and showing us the entire process! Cheers! It’s been a pleasure sharing the processes and all the work that has gone into it. I, at least, appreciate the final result even more. Thank you for tagging along for the ride and giving comments throughout. Thanks Joe! Glad you like it. Love the use of the Khorgorath. Congratulations. Well that is grim in the best meaning of the word. Great job combining all those pieces and I love the paint job. Cheers mate! Grim was what I was aiming for, I’m happy. This is a WICKED conversion! Can’t believe this hadn’t occurred to me until now. I love the execution, very Blanche-esque. Thank you Jason. If this conversion made you think of Blanche, I’m really glad. I can’t think of a better compliment. Well done. He was a hell of a project but well worth the time and effort. The story is great too. I love having fluff/background to bring life to a model. Thanks. I’m pleased with work done, glad you like it too. I had to go back to the humble beginnings to check out what you started with. That is one killer conversion. Along with the painting completed by the end of #DREADTOBER, you’ve done a brilliant job and also given me some more ideas that I can YOINK for further projects. Thanks, Thomas, it’s a solid job and you should be really pleased. Thannk you Adam. I’m happy that you dig it and that you find inspirational.